Myeloid cells (shown in green) exacerbate the severity of multiple sclerosis by sending out chemical signals that boost inflammation and attract autoimmune T cells (shown in red) to the central nervous system. But the molecular cues that enable autoimmune T cells, which are usually kept at bay by the blood-brain barrier, to slip into the central nervous system had remained unclear. In their latest study, published in the Nov. 2, 2015, advance online issue of Nature Immunology, researchers at the La Jolla Institute for Allergy and Immunology report that these disease-causing autoimmune T cells are lured into the nervous system by monocytes and macrophages, a subset of immune cells better known as the immune system's cleanup crew. 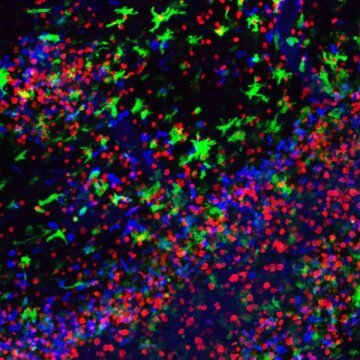 "Our results show that macrophages and monocytes actively participate in the initiation and progression of multiple sclerosis, which has long been considered a primarily T cell driven disease," says the study's senior author Catherine Hedrick, Ph. D., a professor in the Division of Inflammation Biology. "They exacerbate the severity of the disease by sending out chemical signals that boost inflammation and attract autoimmune T cells to the central nervous system." "Multiple sclerosis affects millions of people worldwide," says the study's lead author, Iftach Shaked, Ph.D., a postdoctoral researcher in the laboratory of LJI professor Klaus Ley, Ph.D. "But what's really puzzling is that we all have autoimmune T cells that recognize myelin basic protein but normally they do not infiltrate the central nervous system and cause disease. " Stress can worsen symptoms of inflammatory diseases such as multiple sclerosis but the molecular mechanisms linking cellular stress signaling and neuroinflammation had remained unclear. A chance hallway encounter between Shaked and co-first author Richard Hanna, Ph.D., an immunologist in Hedrick's laboratory, sparked a collaboration that provided a starting point to track the elusive link. Hanna studies a protein known as Nr4a1, which responds to both inflammatory and stress signals and the researchers hypothesized that it may be a key factor in the prevention of autoimmunity affecting the central nervous system. To address the importance of Nr4a1 in brain autoimmunity, the researchers induced experimental autoimmune encephalomyelitis (EAE), a model of multiple sclerosis, in mice with and without Nr4a1. In the absence of Nr4a1, auto-reactive T cells infiltrated the central nervous system much earlier and in greater numbers exacerbating the progression and severity of the disease when compared to the control group. When Shaked and Hanna dug deeper, they discovered that Nr4a1 represses the production of norepinephrine, a major mediator of the body's response to physiological and psychological stressors. Without Nr4a1 to put a damper on production, monocytes and macrophages increase secretion of norepinephrine, which in turn leads to the activation of macrophages, thereby amplifying neuroinflammation and causing a massive influx of T cells into the central nervous system.